This year I decided to finish this red silk corset I started about 2 years ago. I was a little lost on how to finish it. In the end I decided to finish this corset using the things I love the most. Februari is the month of love after all. Delicate lace and flossing are things that make me happy. While I do deviate from my gothic roots on occasion by making something in delicate pastels, when I get to make something just for fun it will most likely have something black in it. 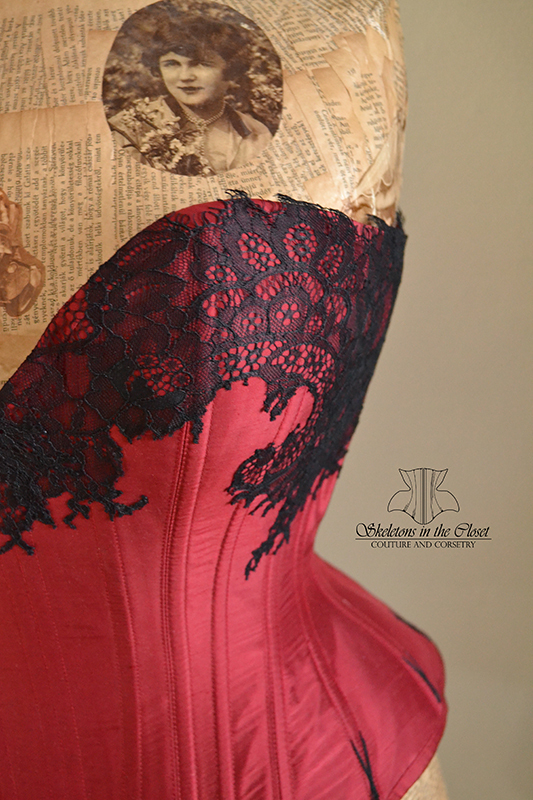 The cut of this corset is a modern Victorian style with a lovely sweetheart bustline. The patterning is done so that the corset will curve nicely over the tummy. 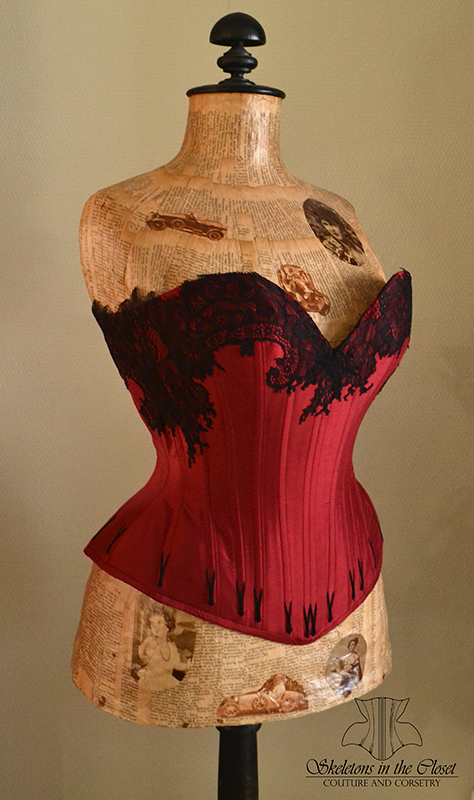 The red dupion silk corset has a coutil strength layer and a cotton lining. The binding is hand-finished on the inside. This corset has 22 steel bones that I all flossed at the bottom with black perle cotton. The black lace is stitched on by hand. This took a lot of time since there are so many little leaves and curves in this lace. The result is a black corset that has lace dripping down from the top and little V flossing at the bottom. I will bring this corset with me to the Salon de la Societe Raffinee this october. If you would like to order a custom corset like this, you can send me an email or use the contact form for inquiries.